This is my largest 10" TV-only console, its cabinet is identical in size to the Capehart 323--which has a 16" tube. 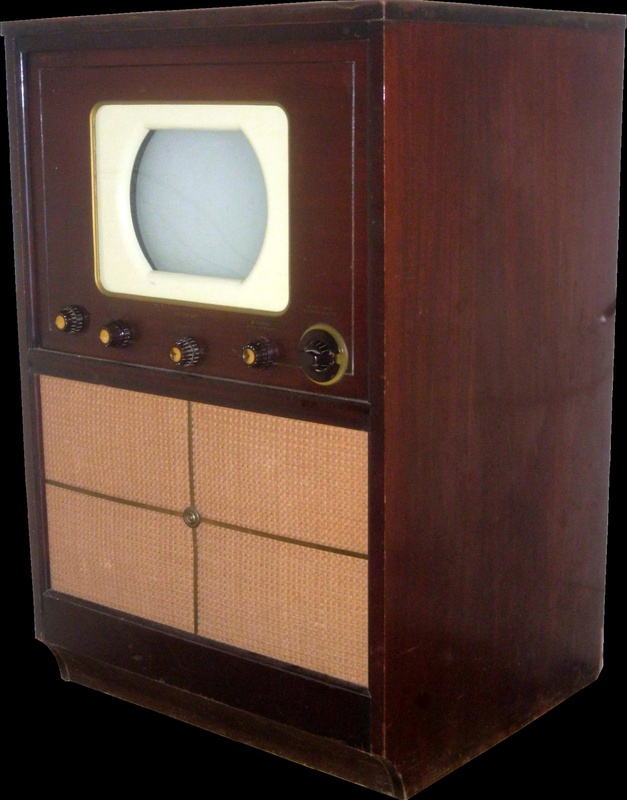 When I was a kid, the great majority of my vintage TV sets were, not surprisingly, acquired locally and were mostly common sets. But when I began to collect in earnest once again in the mid 00's, I started taking trips to Minnesota, Missouri, New Jersey etc. just to pick up my latest eBay find. Quite a few sets also came from the swap meets and auctions at the Early Television Museum in Ohio. This set, which is probably more rare and unusual than any of the others from far and wide, is the first local set to enter my collection in over 20 years. Unlike the early color sets, which needed huge cabinets to house their huge and complicated chassis, there's quite a bit of room inside for this set's modest chassis. 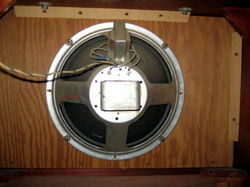 The tone control (knob on the far left as viewed from the front) is actually mounted on an external bracket at the front of the chassis, with nothing behind it but a big empty space. The set clearly had gotten a lot of use, perhaps as a second-hand set for somebody who could afford nothing bigger/better. As found, there were a few tubes missing, including one of the 12AU7s, and the other 12AU7 was too weak to use. Two out of three 6AU6 tubes in the IF strip were bad. After replacing these tubes I still had no hint of reception. It was then that I noticed that, even though the set only uses two 6AL5 tubes, it had three plugged in! With the proper 6AU6 in the driver socket I finally heard some low, weak sound and proceeded with recapping. My recaps generally follow the same routine: electrolytic caps first, then the paper caps in the sweep sections, beginning with the horizontal. I soon found that, even with all the capacitors in the vertical section changed out, along with any resistors out of tolerance by more than 10%, the set stubbornly refused to display more than 3/16" of inverted vertical sweep. After much help from the TV restorers at the Antique Radio Forum, I narrowed the problem down to the vertical output transformer. It was an obvious suspect all along (at least it should have been) because of the way it had been removed from its mountings, then reattached by somebody who seemed to be taking their aggression out on it, snapping off one of the mounting bolts. However, as if possessed, it would work when isolated, such as when an external AC voltage was applied. Then it worked in circuit after tube socket contacts had been tightened, as if poor contact with the tube pins had been the problem all along. It soon stopped working again, to my great frustration. 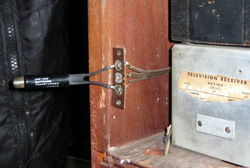 Despite the old transformer having been declared good, experimentation proved there was really no other possible culprit. The output transformer salvaged from a parts set was clipped in and worked perfectly. From that point on, it was a skate to the finish line. The electronic design of the set is pretty simple and not too eccentric. There were a surprising number of large-ish value paper capacitors like .25 mfd @ 600 volt. The chassis wasn't ever cramped, but after those big paper caps were replaced with modern film types, it became positively roomy. 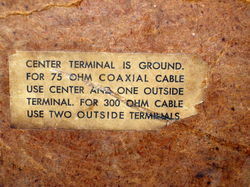 Although carbon composition resistors are notoriously subject to drift in value, a greater number than is typical had to be replaced in this set, some out of tolerance by 50% or more. 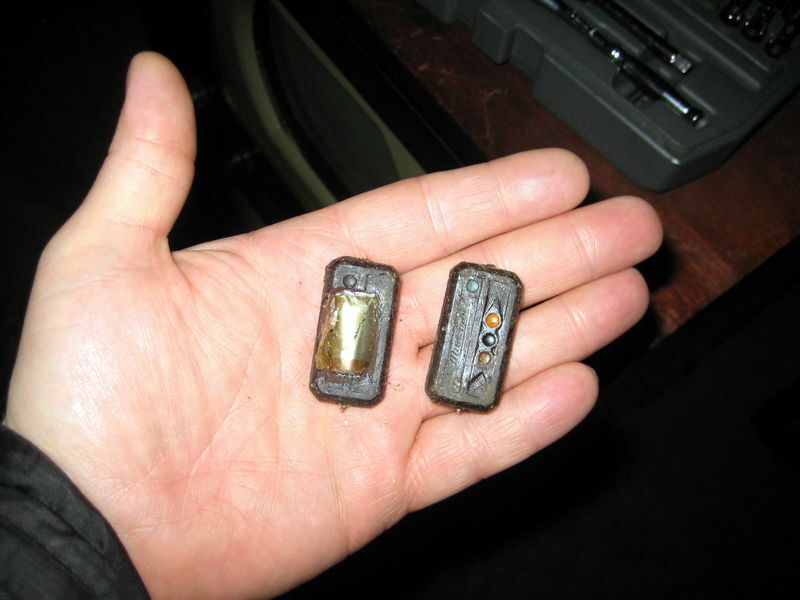 There were two of the dreaded Micamold paper caps in the set, both serving as line-bypass caps, probably because even then they weren't trusted for any duty more critical in nature. I didn't pay much attention to them until one of them blew up. As luck would have it, they were located far up in the one corner of the chassis that wasn't easy to get to. Working past and around a mess of wires and the coil that was in the way, I removed the exploded cap and its twin time bomb and installed modern disc safety capacitors. 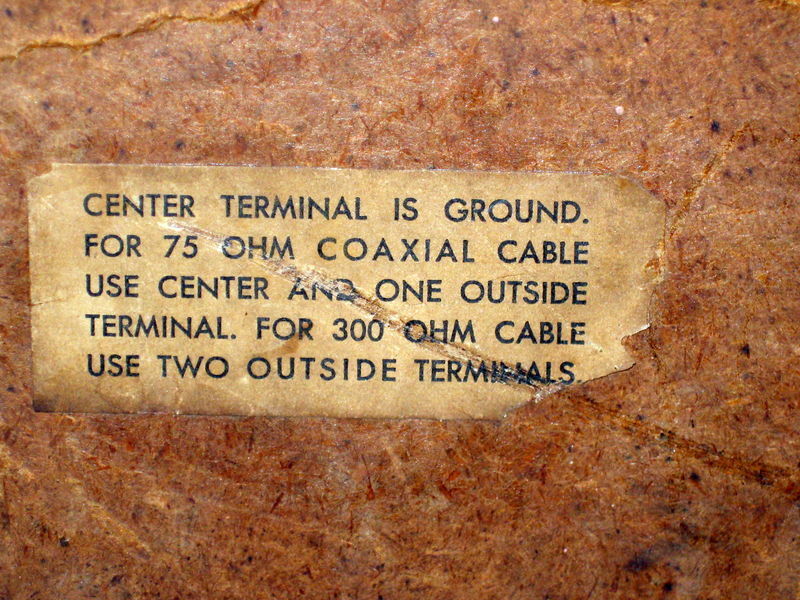 Interestingly, this set provides for connection of either 75-ohm unbalanced or 300-ohm balanced antenna cable. After an attempt to connect coaxial cable directly tripped a GFI, I have been content to use a matching transformer, TYVM. Yes, that's a 12" speaker. As with my 10" GE console, you get sound bigger than the picture. Replacing the last of the paper caps in the audio section brought the volume back up to normal, but the set is prone to sync buzz, especially with any graphics onscreen. No amount of trimmer adjustments will completely eliminate it. I found several cold solder joints which appeared to be from the factory. That casts doubt on the overall build quality, but the finished set works better than I would have guessed based on the recollections I have read concerning similar sets. This one has stable sync and a fairly sharp picture with excellent DC restoration.